The 2018-19 bowl season is nearly upon us, so it’s time to pick some games. We have six of them starting on December 15th, so you best hurry. 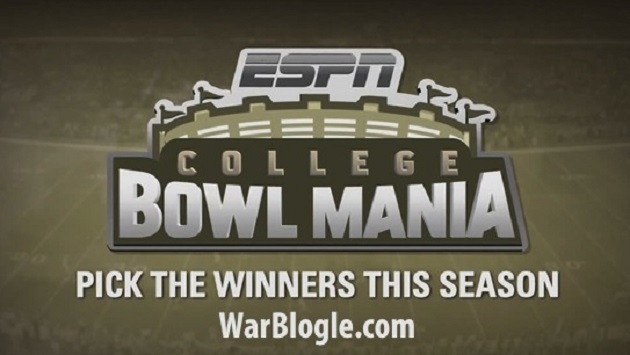 I want this to be the biggest War Blogle Pick ’em of all time. We can do it. As you’ve done or should’ve done in the past, head on over to my ESPN group and start picking. I’ve set it up with confidence points, so you’ll need to set that as well. You’ll need an ESPN.com account, but that takes two seconds, so no excuses. If it asks you for a group password, it’s warblogle. If you’ve been in the pick ’em before, you may see a ‘Rejoin’ button. If you see that button, click it. The overall winner will win an Auburn Hover Helmet. The next few may get some stickers or something. The good stuff. I’ll post the standings as we go along, so you can see how impressively I’m doing from the top. Again, the games start on December 15th so get to picking. Prizes. Competition. Do it.